I hope you are having a good week. Be sure to mark your calendar for the next PWC, April 27 at Prestonwood Country Club and April 28 at Cottonwood Creek. I look forward to seeing you soon. Here’s a devotional thought about the greatest adventure of knowing Christ. This past week I went on a little adventure of my own. I drove to Bartlesville, Oklahoma to speak for a Christian Women’s Club luncheon, then drove on to Coffeyville, Kansas to speak at an evening event in the beautiful Brown Estate Mansion. It was wonderful getting to know fellow sisters in Christ in these precious “villes” and it was a joy to share the powerful truths of God’s love and forgiveness through Christ Jesus. On the way home, I decided to take an adventurous detour to visit the Tulsa Zoo. What fun! 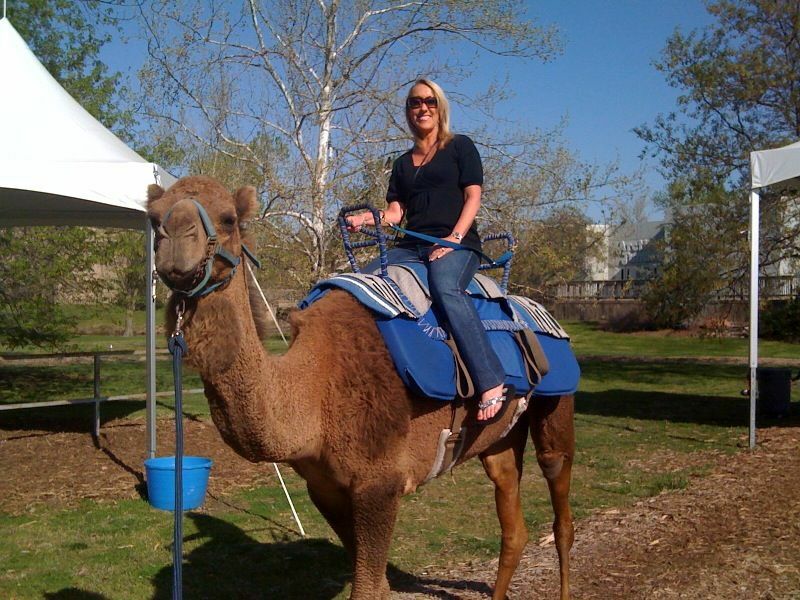 Here I am riding a camel. My long drive from Texas to Kansas and back within 24 hours could have been viewed as a burden, but I chose to see it as an adventure. It was an opportunity to make new friends, share God’s love, see new sights and enjoy God’s great creation. The point I want to make is that every day offers opportunities and adventures. The person God places in your path today is a creation of God and a treasure just waiting to be discovered. The difficult detour in your life is an opportunity to trust God and discover new skills. You can always look at a frustration or a challenge in your life from a new angle and look with anticipation for ways God can bring hope and redemption. Yes life has many opportunities for adventure through the good days and the bad. There is no greater adventure than knowing Christ! Not just knowing about Him, but truly knowing Him in a vibrant relationship and as the Lord of your life. Pursuing Christ makes life meaningful, joyful and fulfilling. As we come to know Christ, we recognize we are dearly loved and we experience his strength and power in our lives each day. We can look to Him for guidance and direction. Take a step today toward the great adventure of knowing Christ, seeking His face, and drawing close in His loving arms.